Flowerbulbsgarden welcomes you to the nicest online flower bulbs website. Every garden needs it's flowers. We will provide the bulbs you like. The nicest assortment online garden bulbs sale with the best quality. Allium, amaryllis, amaryllis supersize crocus, daffodil, narcis, hyacinth, iris, tulips and bulb specialties. Daily we update the webshop with new online flowerbulbs and online perennials. Continue by clicking on the product categories on the left or on the Flower bulbs spring blooming link to order. Delivery for the springblooming bulbs will be done from September until December. 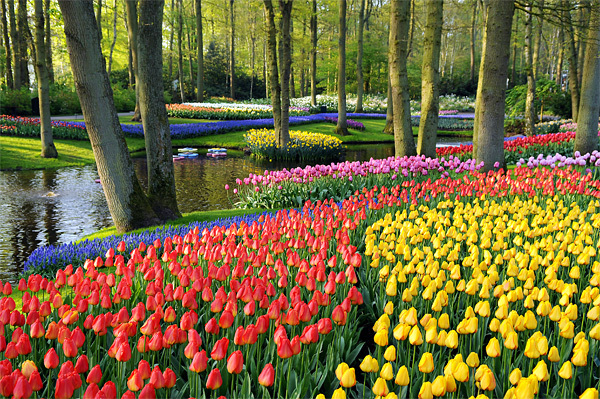 (Picture from the Dutch Keukenhof) Create your own coloured flower bulbs garden with our top quality bulbs.